Holiday season is around the corner, and full casting is now set for the highly anticipated Broadway spectacular Ruben & Clay's Christmas Show, featuring American Idol alums Ruben Studdard and Clay Aiken. The previously announced production will begin previews on December 7 in advance of an opening night set for December 11 at the Imperial Theatre. Joining Studdard and Aiken onstage will be Farah Alvin (It Shoulda Been You), Ken Arpino (Mamma Mia! ), Julian Diaz-Granados (Junie B. Jones), La'Nette Wallace (Rent) and Khaila Wilcoxon (Company). Written by Ken Arpino and Jesse Joyce, Ruben & Clay's Christmas Show will be directed by Jonathan Tessero, with musical staging by Lisa Shriver and music direction by Ben Cohn. The design team includes Rob Bissinger (scenic design), Paul Miller (lighting design), James Brown III (costume design), Bruce Landon Yauger (sound design) and Jason Lee Courson (projection design). Ruben & Clay's Christmas Show will see Studdard and Aiken journeying through a fusion of holiday music and entertainment featuring lighthearted comedy and great talent. The production is slated to play a three-week limited engagement through December 30. 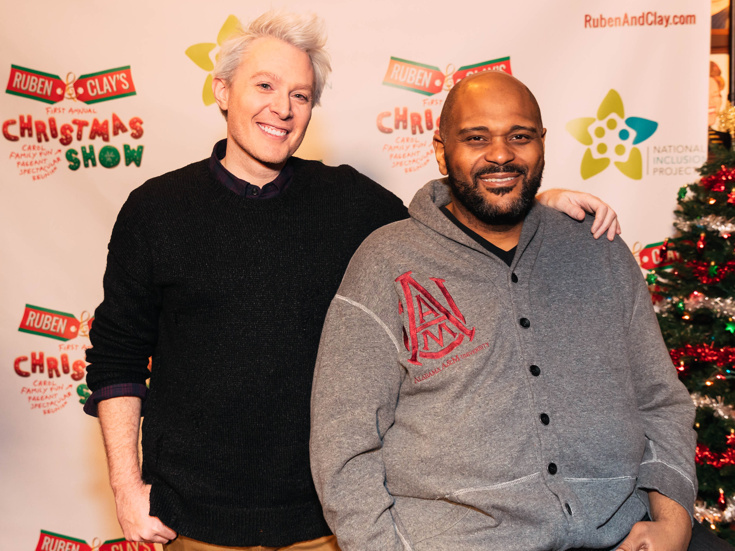 Celebrate the holidays with Clay Aiken and Ruben Studdard!